You have arrived. This means more than just returning home; it announces to your neighbors and the world that you have succeeded. 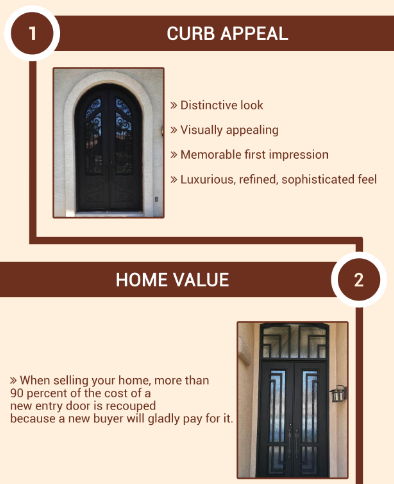 Your front doors can let everyone know you have arrived, because iron doors radiate success, strength and value. 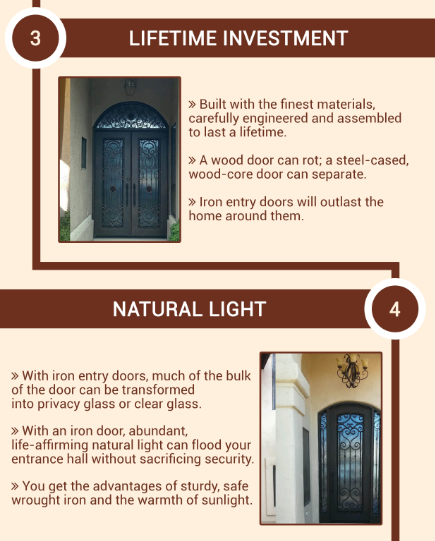 Please consider these seven excellent reasons to consider wrought iron doors for your Scottsdale, Paradise Valley or Phoenix area home. Every home is perpetually in a quiet battle to retain or boost its value. Upkeep is constant and expensive. Factors beyond your control can have an adverse impact on your home’s value. Protecting your investment is vital. The impact of a strong home entrance is well-documented, most recently in Bankrate.com, where more than 90 percent of the cost of new entry door was recouped because new buyers will gladly pay for it. 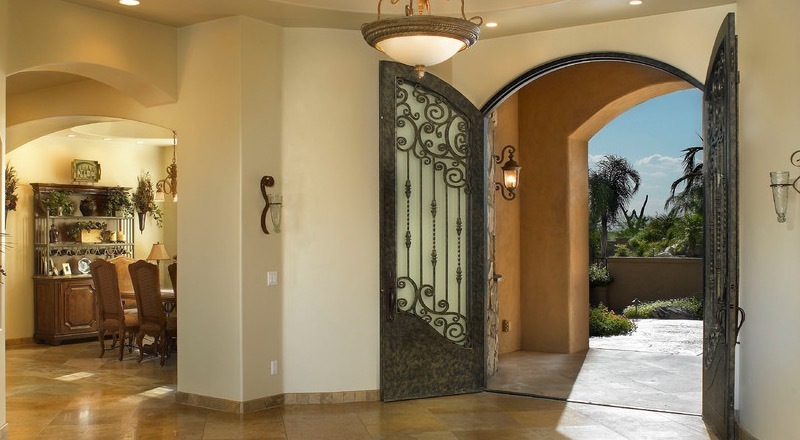 The iron doors homeowners can have from Iron Doors Arizona are built with the finest materials, carefully engineered and assembled to last a lifetime. A wood door can rot; a steel-cased, wood-core door can separate. Iron entry doors will outlast the home around them. Wrought iron and steel are incredibly strong. With iron entry doors, much of the bulk of the door can be transformed into privacy glass or clear glass. With an iron door, abundant, life-affirming natural light can flood your entrance hall without sacrificing security. You get the advantages of sturdy, safe wrought iron and the warmth of sunlight. Modern, beautifully engineered iron doors are fully insulated with polyurethane foam. This, plus five-eighths-inch low-e insulated glass in either the clear or privacy option, provide energy efficiency without sacrificing ventilation. Interior dual-pane glass panels can open to let air circulate. Iron Doors Arizona carefully weatherstrips around the doorway and glass frame to prevent water and air infiltration. The natural light entering through the expanses of glass also help avoid turning on lights when sunlight is abundant and free. Simple oil soap keeps your iron doors clean, shiny and beautiful. No need for special polishes or constant rubbing — the beauty of wrought iron is baked in. 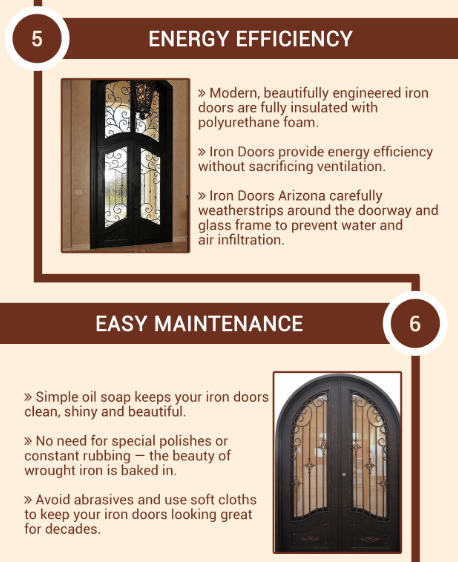 Avoid abrasives and use soft cloths to keep your iron doors looking great for decades. Possibly the most important feature about iron entryway doors is security. Intruders will get one look at your imposing, grand and gorgeous iron doors and opt for an easier target. Iron doors are far harder to break through than glass or wooden doors and will make a distinctive sound when struck. Your family can rest easy knowing the front entrance is guarded day and night by wrought iron security doors. 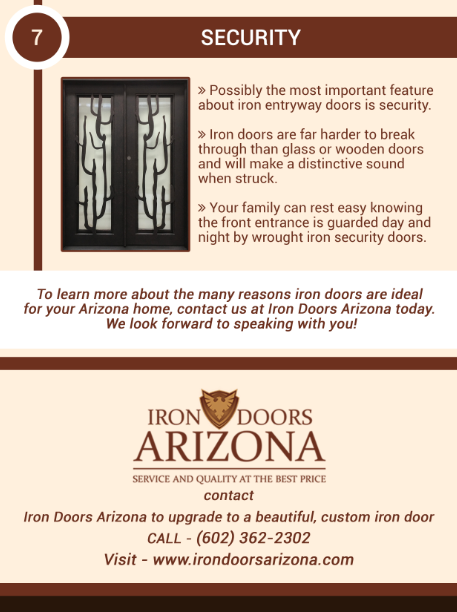 To learn more about the many reasons iron doors are ideal for your Arizona home, contact us at Iron Doors Arizona today. We look forward to speaking with you!